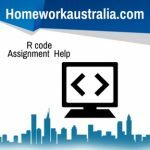 We at Homeworkaustralia.com have established ourselves prominently in the space by delivering solutions of assignments on array of topics in Statistics. 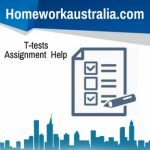 You can upload your Assignment/ Homework or Project by clicking on ‘Submit Your Assignment’ tab given on our home page for any Help with Statistics Assignment/ Statistics Homework or Statistics Project involving Z-Tests or you can e-mail the same to info Homeworkaustralia.com. If you need to schedule an Online Statistics Tutoring Session on Z-Tests , then you can undergo the discussion about it using our Live Chat option. Prof. Fisher has given a method of testing the significance of the correlation coefficient in small samples. According to this method of coefficient of correlation is transformed into Z and hence the name Z- transformation. The statistics Z given by Prof. Fisher is used to test (i) whether an observed value of r differs significantly from some hypothetical value, or (ii) whether two samples values of r differ significantly. For testing whether r differs significantly from zero, the t- test is preferable. A Z-test is any statistical test for which the distribution of the test statistic under the null hypothesis can be approximated by a normal distribution. Because of the central limit theorem, many test statistics are approximately normally distributed for large samples. For each significance level, the Z-test has a single critical value (for example, 1.96 for 5% two tailed) which makes it more convenient than the Student’s t-test which has separate critical values for each sample size. Therefore, many statistical tests can be conveniently performed as approximate Z-Tests if the sample size is large or the population variance known. If the population variance is unknown (and therefore has to be estimated from the sample itself) and the sample size is not large (n < 30), the Student’s t-test may be more appropriate. If T is a statistic that is approximately normally distributed under the null hypothesis, the next step in performing a Z-test is to estimate the expected value θ of T under the null hypothesis, and then obtain an estimate s of the standard deviation of T. After that the standard scoreZ = (T − θ) / s is calculated, from which one-tailed and two-tailed p-values can be calculated as Φ(−Z) (for upper-tailed tests), Φ(Z) (for lower-tailed tests) and 2Φ(−|Z|) (for two-tailed tests) where Φ is the standard normal cumulative distribution function. Z-Tests and t-tests are statistical methods involving data analysis that have applications in business, science, and many other disciplines. Let’s explore some of their differences and similarities as well as situations where one of these methods should be used over the other. Z-Tests are statistical calculations that can be used to compare population means to a sample’s. The z-score tells you how far, in standard deviations, a data point is from the mean or average of a data set. A z-test compares a sample to a defined population and is typically used for dealing with problems relating to large samples (n > 30). Z-Tests can also be helpful when we want to test a hypothesis. Generally, they are most useful when the standard deviation is known. The teacher wants to compare students in her math class (the sample) to students in other math classes throughout the district (the population). The teacher will administer a standardized test with a given mean and standard deviation. The sample is greater than 30. A z-test for population means is not done often because it requires that you know the population’s standard deviation, but not the population mean. This does not happen all that often. The Z-test is used to compare means of two distributions with known variance. One sample Z-Tests are useful when a sample is being compared to a population, such as testing the hypothesis that the distribution of the test statistic follows a normal distribution. Two-sample Z-Tests are more appropriate for comparing the means of two samples of data. The mean and standard deviation of the population distribution are known. The mean of the sample distribution is known. The variance of the sample is assumed to be the same as the population. A z-test is a statistical test used to determine whether two population means are different when the variances are known and the sample size is large. The test statistic is assumed to have a normal distribution, and nuisance parameters such as standard deviation should be known for an accurate z-test to be performed. A one-sample location test, two-sample location test, paired difference test and maximum likelihood estimate are examples of tests that can be conducted as Z-Tests. Z-Tests are closely related to t-tests, but t-tests are best performed when an experiment has a small sample size. Also, t-tests assume the standard deviation is unknown, while Z-Tests assume it is known. If the standard deviation of the population is unknown, the assumption of the sample variance equaling the population variance is made. The z-test is a hypothesis test in which the z-statistic follows a normal distribution. The z-test is best used for greater than 30 samples because, under the central limit theorem, as the number of samples gets larger, the samples are considered to be approximately normally distributed. When conducting a z-test, the null and alternative hypotheses, alpha and z-score should be stated. Next, the test statistic should be calculated, and the results and conclusion stated. For example, assume an investor wishes to test whether the average daily return of a stock is greater than 1%. A simple random sample of 50 returns is calculated and has an average of 2%. Assume the standard deviation of the returns is 2.50%. Therefore, the null hypothesis is when the average, or mean, is equal to 3%. Conversely, the alternative hypothesis is whether the mean return is greater than 3%. Assume an alpha of 0.05% is selected with a two-tailed test. Consequently, there is 0.025% of the samples in each tail, and the alpha has a critical value of 1.96 or -1.96. If the value of z is greater than 1.96 or less than -1.96, the null hypothesis is rejected. The value for z is calculated by subtracting the value of the average daily return selected for the test, or 1% in this case, from the observed average of the samples. Next, divide the resulting value by the standard deviation divided by the square root of the number of observed values. Therefore, the test statistic is calculated to be 2.83, or (0.02 – 0.01) / (0.025 / (50)^(1/2)). The investor rejects the null hypothesis since z is greater than 1.96 and concludes the average daily return is greater than 1%. A Z-test is a hypothesis test based on the Z-statistic, which follows the standard normal distribution under the null hypothesis. The simplest Z-test is the 1-sample Z-test, which tests the mean of a normally distributed population with known variance. For example, the manager of a candy manufacturer wants to know whether the mean weight of a batch of candy boxes is equal to the target value of 10 ounces. From historical data, they know that the filling machine has a standard deviation of 0.5 ounces, so they use this value as the population standard deviation in a 1-sample Z-test. You can also use Z-Tests to determine whether predictor variables in probit analysis and logistic regression have a significant effect on the response. The null hypothesis states that the predictor is not significant. You also have the option to use a Z-test to do a normal approximation for tests of Poisson rate and tests of proportions. These normal approximations are valid when the sample size and the number of events are adequately large. 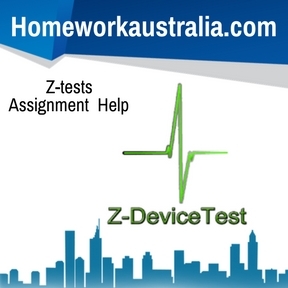 We provide Z-Tests assignment help via e-mail .You can either submit your Z-Tests homework assignment by clicking on “Submit Your Assignment” button or email us at info Homeworkaustralia.com .You can also request to directly talk to our Z-Tests experts by getting in touch with our support team through the “Live Chat” option.